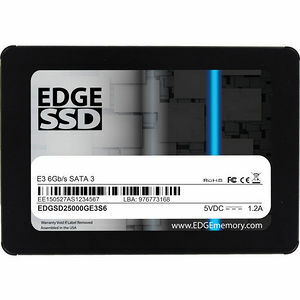 Balancing performance and reliability, the EDGE™ E3 SSD is a storage upgrade at an exceptional value. Featuring the Silicon Motion SM2246EN controller, E3 SSDs are loaded with enhancements to promote a dependable computing environment. TRIM, Wear Leveling, and ECC functions are included and optimize data processing efficiency. S.M.A.R.T. reporting and a built-in temperature sensor assist with monitoring drive health. Advanced features such as Early Bad Block Retirement and DataRefresh add an additional layer of protection to keep the E3 running at optimum performance.